The International Space Station Increment 25 are ending their first full week on the orbital outpost, as specialists on the ground continue their investigation into the events leading up to the failure of the GPRVs (Gas Pressure Regulation Valves) in April and Pump Module (PM) in July. Engineers are also evaluating the ISS’s long-term module configuration, and future payloads to be launched aboard SpaceX’s Dragon vehicle. Starting Tuesday, the crew – consisting of NASA Astronaut Doug Wheelock in Command, Russian Cosmonaut Fyodor Yurchikhin as Flight Engineer-5 (FE-5), and NASA Astronaut Shannon Walker as FE-6 – kicked off a busy work schedule that continued throughout the week. A major task completed this week was Inflight Maintenance (IFM) on the T2 COLBERT treadmill. Located in Node 3, at rack bay Forward 5, the T2 is the only treadmill on the US segment of the station. Starting Tuesday, Wheelock and Walker disassembled the T2 rack’s Vibration Isolation System (VIS) hardware, removed the T2 rack from its bay in Node 3, and moved it to a temporary stowage position in the Node 2 forward endcone area. 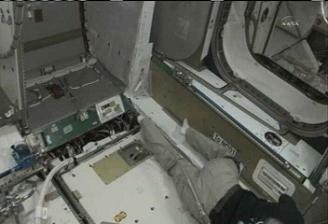 Once in Node 2, Walker removed the Power Avionics Unit (PAU) from the T2 rack and replaced it with a new unit. Both PAUs have a design flaw which results in limited motorized speeds of approximately 8 mph. The old unit that was removed from the T2 rack will be returned to the ground to so that engineers can verify the root cause of the failure. On Wednesday, Wheelock and Walker moved the T2 rack from its overnight stowage location in Node 2 and re-installed it back in its Node 3 Forward 5 bay, followed by re-installation of all VIS components. Wheelock and Walker continued their work on the T2 rack Thursday by checking out the new PAU and re-centering the rack it its bay. An unmanned Activation & Checkout (ACO) run of the T2 rack was completed on Friday, and a manned ACO run was completed on Saturday. While the T2 rack was absent from its Node 3 Forward 5 bay on Tuesday – which created access to the Water Recovery System-1 (WRS-1) rack in the Node 3 Deck 5 bay – Walker started another IFM procedure to install a T-hose on the WRS-1 rack. The WRS-1 rack recycles urine into drinkable water on the Station. After rotating the WRS-1 rack out of its bay, which exposed the rack’s rear, Walker routed the T-hose to the rear of the rack. The new T-hose will provide the crew with an alternate source of portable water by using iodinated water reserves, called Contingency Water Containers-Iodine (CWC-Is). On Wednesday, Wheelock and Walker finished up the WRS-1 T-hose installation and rotated the WRS-1 rack back into its Node 3 Deck 5 bay. A delay was caused by the T-hose not fitting inside the volume of the WRS-1 rack, which forced the crew to re-wire the T-hose mounting plate and remove some foam to make the rack’s rear panel fit back on. In parallel with the IFM tasks going on in the US segment of the station, Yurchikhin completed installation and subsequent checkout of the new Proximity Communications Equipment (PCE) for the European Automated Transfer Vehicle (ATV) in the Russian Segment (RS) this week. 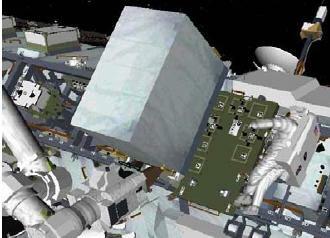 Russia and ESA conducted a transmission test of the PCE from the ground early on Sunday morning. 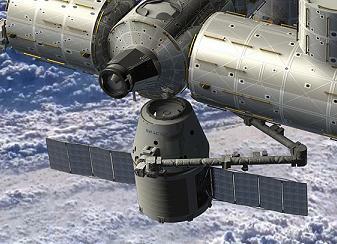 The PCE will be used during the approach & docking of ATV-2 in February. The crew’s usual intensive program of scientific experiments continued throughout these IFM tasks. Another event of interest this week was the translation of the Mobile Transporter (MT). The MT, with the failed PM in tow, moved along the station’s truss from Worksite 4 (WS-4) to WS-6 on Tuesday night. The translation was controlled from the ground by the Canadian Space Agency (CSA) via S-band. Russian thrusters were disabled for the duration of the translation, and no unisolated exercise was allowed by the crew. Monday’s Space Station Program Control Board (SSPCB) notes – available in full on L2 – included news on the status of current failure investigations, as well as many current and upcoming ISS programs and events. A particular item of interest in the SSPCB notes related to anomalies seen in both the S1 and P1 Gas Pressure Regulation Valves. 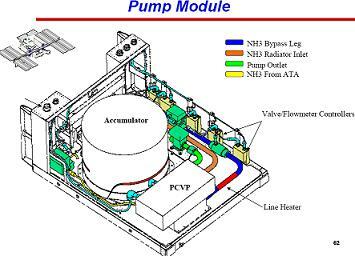 The GPRVs control the pressure of nitrogen that flows from the Nitrogen Tank Assemblies (NTAs) to the station’s External Thermal Control System (ETCS) loops. During the STS-131/19A mission in April, the S1 GPRV failed to re-open after it was closed in order to isolate the station’s Loop A coolant system from the S1 Ammonia Tank Assembly (ATA) – which was depressurised and replaced during EVA-2 of the mission. “When ATA vented for 19A, GPRV load on the ‘friction interface’ was only 8lbf (pounds of force). When in the full fill position, the load is ~800lbf. When the GPRV was commanded to repressurize the interface, the friction interface slipped so no additional nitrogen (N2) was supplied to the ATA from the NTA,” stated the SSPCB notes. After weeks of troubleshooting, the S1 GPRV was eventually “back-pressured” and opened as expected to pressurise the new ATA, which was in turn integrated into that Loop A cooling system. “Possible theories for why the friction surface slipped include vibration, and that the optical switch position shifted (which allows the pressure on the friction interface to go too low),” added the SSPCB notes, which went on to state that in future, the pressure will not be allowed to get too low during vent operations. The SSPCB also reviewed a separate anomaly, when the P1 GPRV was commanded to 378 PSI-Alpha (PSI-A) prior to 19A, pointing out that “the GPRV actually went to 406 PSI-A before the Fault Detection, Isolation & Recovery (FDIR) triggered a reset back to 360 PSI-A”. According to the notes, “the team considers it unlikely that a mechanical or Foreign Object Debris (FOD) issue is what caused this event”. The leading theory is that the event was caused by an error in the electrical system, which was probably reset during a power cycle and will therefore likely operate fine during its next use. The SSPCB recommendations were to leave both GPRVs off under nominal circumstances, and only use them during required repressurisations. In future, depressurisations will be done in small steps to ensure that the GPRVs do not go to the full vent position. Teams will continue with the P1 GPRV troubleshooting, which at this time includes “verifying the motor responds as expected when the GPRV gets near the full fill optical switch”. Another major item of interest in the notes was the status of the investigation into the S1 Truss Pump Module failure. The S1 Truss PM unexpectedly failed on July 31st 2010, sparking an intense period of ISS reconfiguration, and development of procedures for what ultimately turned out to be three epic EVAs to R&R the failed Pump Module. According to the SSPCB notes, the failure investigation team are looking at “whether ammonia could have leaked into the pump motor stator area (sealed and filled with N2 normally)”, and will be determining “whether the ammonia flow was interrupted in the ‘secondary’ flow areas in the pump (used to lubricate and cool the bearings and friction surfaces)”. The notes also state that in late 2008, it was observed that the overall pump pressure was reduced, and that delta pressure (PSI-D) across the pump was showing a variance from nominal values. Current spikes were also noted during this period. The SSPCB were informed that the delta pressure and current draw data were not part of standard analysis in the past, but that they will be reviewed regularly in future as they may be useful for identifying possible pump degradation. It was also stated that 370mS (milliseconds) prior to the 54A current spike that occurred during the July 31st failure, the current draw from the pump went to zero Amps. The SSPCB notes also included some information on the ongoing ISS long-term configuration assessment, relating to the four unused berthing ports that will be available on the ISS post-Shuttle (Node 2 Nadir & Zenith, plus Node 3 Forward & Aft). Of those four ports, two of them (Node 3 Forward & Aft) will have limited usage due to clearance issues, which means that only Node 2 Nadir & Zenith will be usable as Visiting Vehicle (VV) ports. To complicate matters, Node 2 Zenith – which is the current back-up VV port – does not have the capability to support Orbital’s Cygnus vehicle, due to clearance issues with a grapple fixture on Cygnus, and will be unavailable post-2014 due to the planned addition of the Orion docking adapter to that port. This issue became the subject of a major ISS presentation in June (available in L2). Via the updated SSPCB notes, NASA ISS Program Manager Mike Suffredini stated that he wants to have two berthing ports available that can support two VVs at the station simultaneously, and a third “back-up” port that can be used in case there is a problem with any of the other two ports. 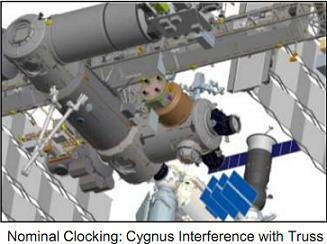 This requires three unoccupied berthing ports on ISS capable of supporting VVs. The two primary berthing ports will need to have adequate clearance to support external operations, such as extracting the Exposed Pallet (EP) from JAXA’s H-II Transfer Vehicle (HTV), and extracting the Trunk from SpaceX’s Dragon vehicle. According to the notes, the SSPCB will recommend – as an interim solution – moving the primary berthing port to one that does not interfere with a capture volume when only one VV is present at the ISS. This would mean that Node 2 Zenith would become the primary berthing port for HTV/COTS vehicles, which would in turn make Node 2 Nadir the back-up port, enabling it to be used by another VV if a vehicle became “stuck” at the Node 2 Zenith port. Under current arrangements, if a VV became stuck at the current primary port – Node 2 Nadir – and a Cygnus arrived at the station, the Cygnus would have nowhere to berth to, as it would not be able to use the Node 2 Zenith port due to clearance issues. In the long-term, the ISS program is looking at how to create more unoccupied berthing ports on ISS. 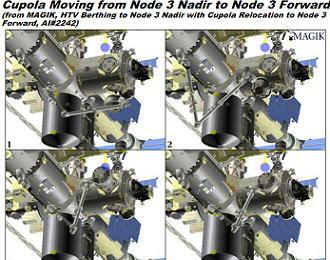 Potential solutions include moving the PMM (Permanent Multipurpose Module) – which will be added to the Node 1 Nadir port during STS-133/ULF-5 in November – to the Node 3 Aft Port, and moving the Cupola (currently located on the Node 3 Nadir port) to the Node 3 Forward port (which would require disposal of the Pressurised Mating Adapter-3 (PMA-3) element). This would free up the Node 1 Nadir & Node 3 Nadir ports for VVs, or a new module specifically designed for supporting VVs. Another solution previously considered would be to move the PMA-2 (Pressurised Mating Adapter-2) element – which is currently located on the Node 2 Forward port in order to facilitate Shuttle dockings – to the Node 3 Aft port in the post-Shuttle era, as it would no longer be required for Shuttle dockings at this time. This would free up the Node 2 Forward port for the addition of the Node 4, also known as the Docking Hub System (DHS), which could in turn support VVs. The SSPCB agreed that near-term actions will be to “make sure Node 2 Zenith is available as a backup port for HTV-2 and subsequent berthing vehicles until other options become available (probably not until the 2014 timeframe)”, and that they will “work with Cygnus and their grapple fixture location to ensure that they can use Node 2 Zenith as a backup port”. Another item mentioned in the SSPCB notes related to external payloads for Flight 3 of SpaceX’s Dragon vehicle. Two payloads are currently manifested for Dragon Flight 3 – R2D2 and DPP. Both payloads relate to the SPDM (Special Purpose Dextrous Manipulator), or ‘Dextre’. The SSPCB approved all costs for R2D2. However, due to the fact that some issues and discussion exist with the CSA regarding DPP, it is not yet known whether DPP will fly as currently envisioned or not. Therefore, the SSPCB has not approved funding for the DPP at this time. According to the SSPCB notes, the funding is “mostly for software changes required to implement the feedback SPDM autonomous commanding capability”. A decision on DPP funding will be needed by MOD within the next six weeks so as to avoid cost increases. Meanwhile, in a new scientific discovery aboard ISS this week, the Japanese space agency (JAXA) announced some new results from its Monitor of All-sky X-ray Images (MAXI) experiment. MAXI is attached to the Exposed Facility (EF) of Japan’s “Kibo” segment of the station, and is used to permanently monitor the X-ray environment of space. On September 25th, MAXI’s X-ray cameras discovered an uncatalogued X-ray nova in the constellation Ophiuchus, which is of particular interest to scientists as it is likely to be a binary system with a black hole. The nova was named “MAXI J1659-152”. In other ISS program news, the launch of Europe’s ATV-2 has been pushed back to February 15th, 2011. This will result a docking to the ISS at the Service Module’s (SM’s) Aft port on February 26th – one day prior to the launch of STS-134/ULF-6.